Everyone’s stomach turned on Saturday when Wendell Moore went down with a knee injury, and not just because the injury looked scary. It is always hurtful to see a young prospect suffer an injury, especially in a special moment/event for him and his team. We keep him and his family in prayer and we all hope that the injury is not serious. Losing a player of this caliber and this type of situation typically would completely derail an ordinary team and your average player – not just from a physical player perspective but also from a mental perspective. What CP3 and the Langley twins showed is that they are far from ordinary as a team and these two players are far from being average. In what may have been one of the most compelling stories of the entire NYBL seasons; Kobe and Keyshawn Langley put the their team on their backs and carried them to the 2019 NYBL championship game after going 14-1 in the regular season. Leading most of the way verses All Ohio Red, the NYBL defending champs, CP3 simply ran out of gas late in the 3rd quarter – even with them not winning the championship without arguably their best player available; they may have proved something to every fan in attendance, every team that they played, and possibly themselves that they have a unmatched resolve and the heart of champion. If trophies were given out for that, they are the hands down winners. In this situation two of the most team oriented guards in the country stepped up and showed why they are the reigning national champions and why they as individual players can be considered stars in their own right. Keyshawn Langley is a lean and smart point guard with an excellent basketball IQ. He excels in transition with his ability to push and advance the ball to apply constant pressure to the defense. Keyshawn can hit the mid-range pull up, open three which he did numerous times in big situations and he can get to the paint where he is able to create opportunities for himself or his teammates. Always playing with his head and eyes up Langley has an excellent understanding of time and score and operates as an extension of their head coach on the floor. He believed this weekend so his teammates believed; the true definition of a leader and of a point guard. His numbers are never gaudy or eye popping; but it’s not because he isn’t capable as proven by his scoring outburst that were provided when needed – but his first priority is winning and he does whatever it takes to get that done. By default this makes him one of the best lead guards in the nation who so happens to play on one of the best teams in the nation; coincidence we think not. Kobe Langley, the ultimate combo guard – can play either back court position seamlessly. A shooter/scorer with a laser quick release and smooth stroke has a strong frame that can take and absorb contact. He's established that he's can strokes threes with range but also handle efficiently; he constantly makes plays with the ball in his hands and makes good decisions with the ball. Langley is a true combo guard in every sense of the word. During the weekend he wowed the crowd with some amazing and acrobatic and one plays; in the paint, in space, and in the open court he is a straight up problem – uncontainable. He pushes the ball well in the open court with all the attributes of a high level point, has terrific vision, and his passing is extra special in the open court. He is an outstanding athlete who affects the game with his quickness, assertiveness, IQ, and leadership Kobe is one of those player that every coach wants on their team and what every championship contender has to have. 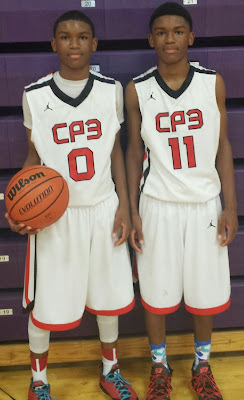 The Langley twins are what you call special players and the CP3 All Stars are what you call a special team. In a world of team hopping and disloyal self-serving player movement – this group has dedicated itself to each other and dedicated itself to improving as individuals and as a team- they have dedicated themselves to winning. Their dedication to and attention to detail on and off the court has made them champions and a pillar of light in a sometimes dark basketball world. It can only be appropriate that such a team play in such a league as the NYBL the place in which the most special players and teams compete.